Learn how to make sprouts, with step by step pictures and video, a simple and mess free method followed in our home for more than 20 years. I don’t know how i missed posting this recipe in my space, as it is a usual practice at my place to make sprouts twice in a week. My husband and his brothers and even my mil used to eat raw sprouts everyday along with breakfast. Initially i was hesitant to eat the raw sprouts and later when i started eating them raw, i liked the taste and even slowly my kids started eating sprouts now a days. I learnt to make this easy way from my mother in law and i wanted to share the procedure of how to make Sprouts at home. Also read the notes section without fail. 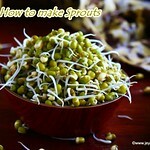 Description: Learn how to make sprouts, with step by step pictures and video, a simple and mess free method followed in our home for more than 20 years. Wash and soak the green moong dal in water, for 6 hours. Spread this in a casserole (hot box| hot pack) and close it and keep it untouched for 10- 12 hours. (preferably over night). Do not crowd the hot box, use a bigger one to spread it well. I soaked at 9 am in the morning and put this in the hot box around 3 pm. I opened at 6 am in the morning. You can see the nice moong sprouts the next morning. Store this in an airtight container and keep it inside the refrigerator. This sprouts will stay good for 8-10 days. The quality of green moong bean is most important and if it is a old stock or too dried ones, sprouting will not happen properly. Always select a dark green colour green moong bean. Always soak the green moong dal in clean drinking water. Soaking time should not be less than 6 hours. If using any other lentil like black channa or white channa, soak for 10 to 11 hours. This is a new technique... I've got to try this. I love sprouts, raw and steamed both. I never tried putting these in casserole , usually wrap it in a damp cloth..will try this, useful post! wow this method sounds easy...i always tie it tight with a damp cloth and keep in a warm place....:) Thnks for sharing dear! I always use man's handkerchief to wrap up and keep them to sprout. never tried this way. its interesting. Even I do this the same way, only difference I cover them with a wet paper towel, awesome clicks Jeyashri..
A helpful post and the clicks are lovely. Lovely photos Jeyashri!! I am sure this will help a lot of people! I love sprouts too.. so filling and healthy. Looking fwd to the recipes. I made sprouts from lentils a few weeks ago and they were great! I also saved a bunch and planted them with the sprouts poking out of the dirt... now I have lentil plants a foot tall! Beautiful and refreshing pics !! My favorite sprout !! the mung beans have sprouted so well. a great tip to use the hot box. Beautiful clicks!! Thanks a lot for the nice idea of using hot box to make sprouts!! Lovely clicks...I usually tie it in a cloth...This method is more easy...Thanks for sharing.. I love the idea of eating sprouted lentils. That is something very famous in our house. My amma would make a sandwich with them. They are so healthy and protein rich. Informative post Jay! Like all the others, I too use wrap in a damp cloth. spreading in a casserole is new to me. Lovely clicks Jeyashri, very informative post. Your method seems easy, thanks for sharing this dear! This method looks super easy..will try it soon..
tried this method ...got super sprouts ...method was so easy ..Thanks once again. I tried this method n loved the sprouts. It is so simple n fss free. Thanks for sharing. Thanks for writing to me. After draining the beans, do not dry too much as the sprouting will not come if it is too dry, so do not pat dry. And ensure that there shouldn't be any water too. Just the beans should be moist and you can feel the wetness if you touch them. Many times this will get fungus if there is too much of water also. Hi Jeyashri! never knew sprouting was SO easy! THANKS! so much...no more buying sprouts. Hi Jeyashri! never knew sprouting was SO easy....THANKS! No more buying sprouts....keep up the good work! So with the hot box, It's great because it's insulated, keeps moisture and is dark correct. Overnight is pretty fast for that amount of sprouting as far as I can tell. The hot box differs from a crock pot in that it has no actively heating element right? Just trying to understand the pros of them, as they're not cheap. I've been using my fido jars. Also, I always thought the use of a hand cloth or towel was to ensure that gases could circulate while still keeping heat in.